With Super Smash Bros. for Wii U, the game really comes off as a celebration of all things Nintendo. Well, what about a celebration of all things Final Fantasy? I use that segue to reveal this all-new review for a Nintendo 3DS game that launched a couple of months ago. 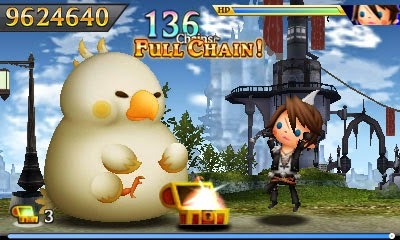 It's Theatrhythm Final Fantasy: Curtain Call, and it does the Final Fantasy name and celebrating it very well. Rhythm games are a take 'em or leave 'em type genre for me. Some I really can get into, while others leave me yearning for something else. The original Theatrhythm Final Fantasy released on the Nintendo 3DS a couple of years ago, and until that point in time, Samba de Amigo was my favorite rhythm game. 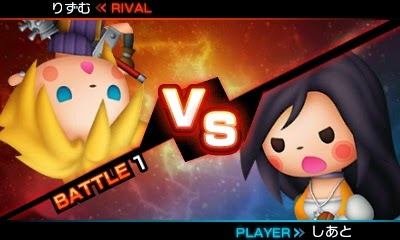 Due to its fun gameplay and subjectively better music, Theatrhythm dethroned Samba quite handily. Now, a new entry in the Theatrhythm franchise arrives, offering more than double the amount of music available, an immense amount of new content, and pretty much serves as a love letter to anyone who finds Final Fantasy music and the series in general interesting at all. It's a rhythm game so good that it might just make the original obsolete. Does it do this? 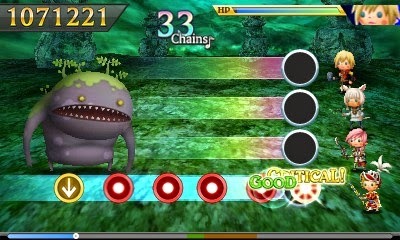 Theatrhythm Final Fantasy: Curtain Call contains the same gameplay as its predecessor. As notes scroll across the screen, the player has to tap the touch screen, swipe in the indicated direction, or hold the stylus down in time with the music, or for those less musically inclined, when the note crosses a special marker. Doing this as close to the beat as possible awards the most points. Doing an incorrect or poorly timed interaction with the touch screen can result in a "bad" rating, resulting in losing HP. "What big teeth you have, King Behemoth!" "All the bigger to get bashed in, my dears." HP...? In MY rhythm game? Well, yes. The original Theatrhythm was a ridiculously remarkable concept, taking the rhythm genre and mixing it with an RPG. Like an RPG, you have a party you create out of four Final Fantasy all-stars, and through every music stage you complete with them, your party earns experience points. Leveling up characters not only improves their stats, but it also occasionally earns them new skills, magic, and abilities to equip. Unlike the original Theatrhythm, however, there's no arbitrary point penalty for equipping skills to your party, which is a massive and welcomed improvement, as any fan of the vanilla release can tell you. not equipping skills this time around. Messing up too many times or missing too many notes will result in your party's HP decreasing all the way to zero. This, of course, means you get a game over. However, equipping helpful skills, like moves that heal HP after so many notes have been correctly hit, makes the various music stages more manageable. There are three types of music stages within Curtain Call. The field stage has your party leader trekking from right to left through a landscape of some sort. Through successful taps, swipes and holds of the touch screen, your party leader moves faster through the side-scrolling environment. The better you do, the more items you obtain. make an appearance in Curtain Call. 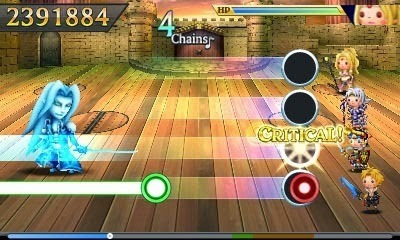 Battle stages require the tapping of notes for your party of four to deal damage to enemies on screen. 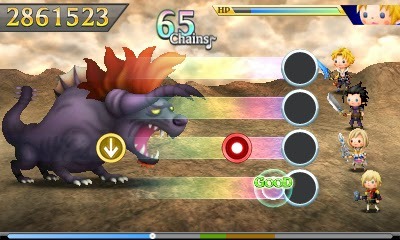 There are four lines of notes that appear on screen, one for each party member to unleash attacks with, though more than one note is never required to be played at the same time. As enemies are defeated through proficient touch screen rhythm skills, experience is earned and the chance for items increases. Every fourth enemy serves as a stronger boss who usually holds the rarest of items. Nonetheless, missing notes means that the enemy will attack you instead! Sephiroth when you can unlock the real thing? Finally, the third type of stage in Theatrhythm is the event stage. These only occur when selecting songs from the main menu and only encompass the Final Fantasy games with cinematic cutscenes (i.e. Final Fantasy VII and on). 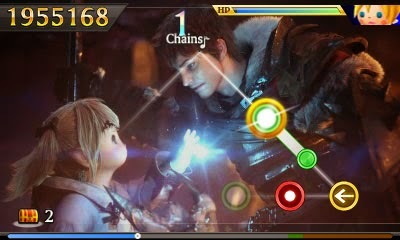 As a scene from one of the games plays in the background, you perform your typical touching tactics in time with the on-screen prompts and music. of the three stage varieties. Outside of simply selecting one of three difficulties to play the over 200 Final Fantasy songs within Curtain Call, there is an all-new mode which replaces the decidedly grind-heavy Chaos Shrine from the original, Quest mode. 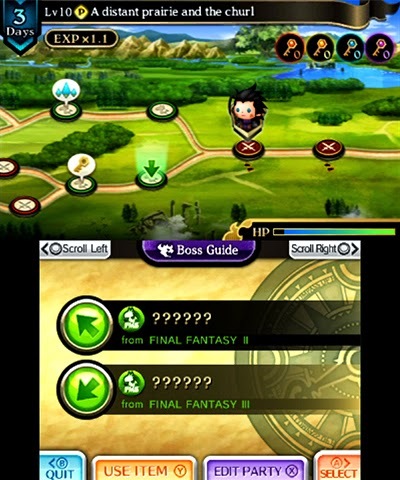 Quest mode allows you to pick your path through a landscape, playing field and battle stages, to reach a final dungeon where a boss monster dwells. In between stages you can use items like potions to heal your party's HP, use teleport stones to skip especially challenging levels, and earn special goodies you otherwise wouldn't be able to obtain. Hundreds of quests await, though only a meager amount are unlocked at first. 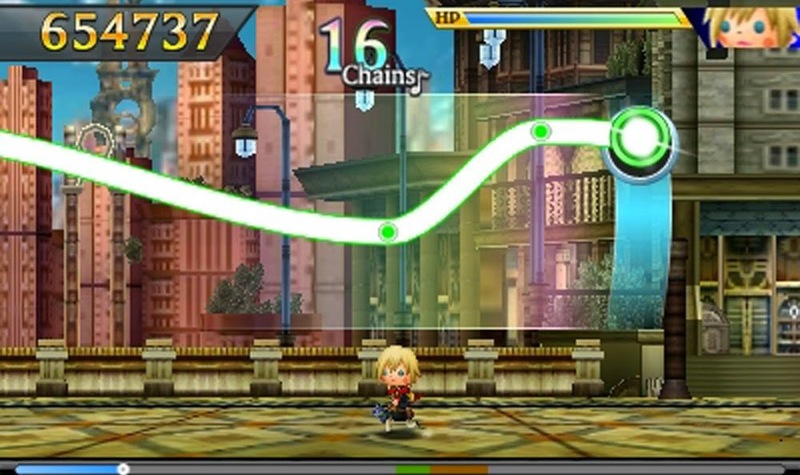 Like the original Theatrhythm, generating Rhythmia is the main way of unlocking content within Curtain Call. As you complete songs, you earn Rhythmia points based on your performance. At certain milestones you earn content like new songs, crystals used for unlocking new characters, and other bonuses. These happen quite regularly, so you always have that carrot at the end of the stick to keep following, guiding you to continue playing. You always have something to work for, and it doesn't take long to be rewarded, which is nice. Unlocking characters was something in the original Theatrhythm that did take long for a reward to happen. In that game, you had to basically grind by replaying the same Chaos Shrine movements (two songs apiece), beating the same bosses over and over again, and doing so with no real guarantee you'd unlock the right color crystal you needed, or if you'd even get a crystal at all. boring the rest of you! With Curtain Call, the all-new Quest mode has it where you can see the reward you will get for beating the various bosses that stand in your way in that particular quest, which is usually a handful of a certain color of crystal. Each colored crystal type unlocks one of a set of new characters to add to your roster. You even get to pick which character from that set you'd like, so can happily choose whether or not you want that wussy Vaan from Final Fantasy XII over the awesome golden-locked Edgar from Final Fantasy VI. There are over 100 different quests of varying lengths to go through with different rewards. As you can only get a reward from a boss once, Quest mode encourages you to play different quests for different rewards. You even earn new quests by completing other quests and by simply facing players online. Yep, this time SpotPass offers the ability of getting new quests to play rather than only offering such a solution through meeting other people locally through StreetPass. Online battles pit your selected party against another player's, dueling it out on a battle music stage chosen from one of you or your opponent's selection. It's a battle to see who earns the most points by the end of the song, or alternatively, which player is left standing, taking into account that fouling up a note makes your party lose HP. Even without a victory, you earn one Collectacard, a cool collectible within the game, as well as that player's quest that is attached to their profile card. Cloud won't play nice just because you're a princess! Finding people to play the original Theatrhythm was challenging, so having online play extends this already content-heavy and replay-able game even more! Not like you needed a reason to play Curtain Call more, what, with its many songs, three difficulties for each (though the gap of challenge between Expert and Ultimate could be lower), insane amount of characters to level up, just over 100 trophies to aim for, a multitude of collectible cards, and so forth! If you're wondering just how much Final Fantasy love is in Curtain Call, consider this. Not only are the mainline Final Fantasy games, currently all 14 of them, represented with characters, enemies, backgrounds, and songs (about a dozen per game), but so are many of the spin-offs, such as the Crystal Chronicles series, Final Fantasy Tactics, Mystic Quest, Dissidia, Crisis Core, among many others. There is so much Final Fantasy goodness within Theatrhythm Curtain Call that it's hard to not sit back and go "whoa" at just how much there is. to be greeted by a fat Chocobo? Here comes the "tricky" part which is actually not that tricky at all! 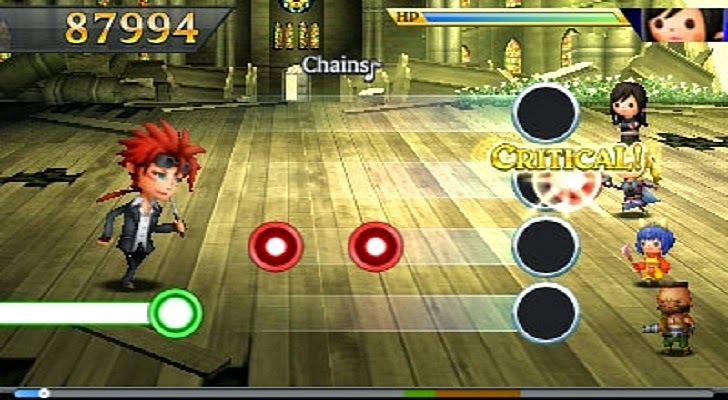 Should you even go back to the original Theatrhythm if you want Curtain Call? Furthermore, is there a point to buying the original over its sequel? Well, unless you sincerely prefer the idea of having the Chaos Shrine over the new Quest mode implemented for Curtain Call, there's really no reason to pick up the original vanilla Theatrhythm release over its superior sequel. You get all of the songs from the original game, including its downloadable content-- equaling over 200 songs alone-- you get a metric ton more characters to play as with less ridiculous grinding to get the particular character you want, and you don't have to deal with handicapping your characters by removing abilities from them for some arbitrarily dumb scoring reason. 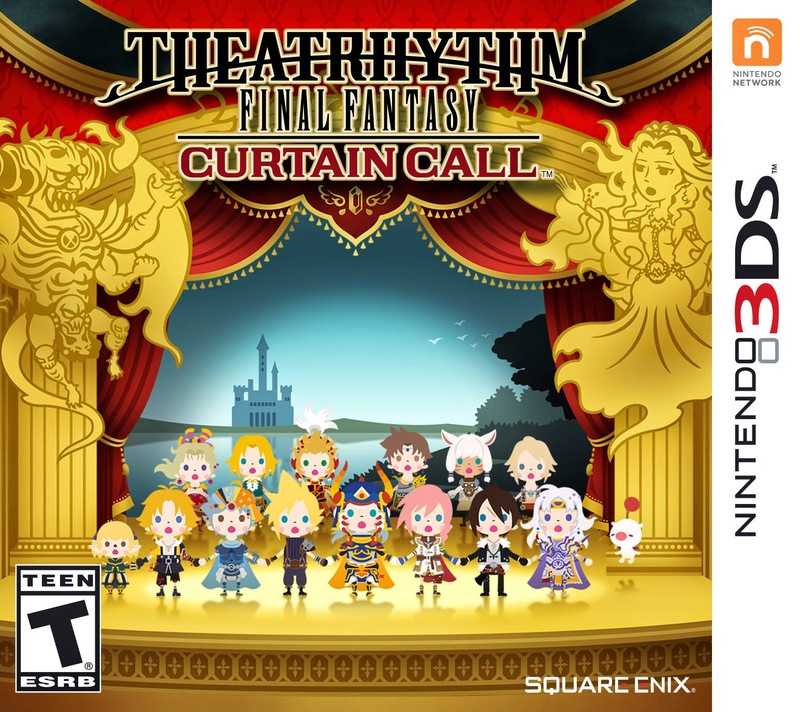 Truth be told, Theatrhythm Final Fantasy: Curtain Call is a marvelous mecca for Final Fantasy fans, and an insanely awesome music game on top of that. If you have any love for great music or Final Fantasy, you owe it to your ears, inner rhythm, and reflexes to purchase Curtain Call.